Learning a new language is a lot like learning to sing. German is no different. In fact, German songs are a great way to help you get to know the language a better. The more you listen, the more words and phrases will stick in your ear. Here are six of my favorite German songs from a wide range of styles, along with a neat phrase from each one to show you the language-learning aspect. I’ve ordered them roughly from easiest to hardest, though of course that’s subjective. Did you know the Beatles released two of their own songs in German while they were living in Hamburg? They strongly preferred singing in English, so that’s why we don’t have a full German collection of their songs. Pity! This incredible overlooked gem was used a couple of years ago in the film This Ain’t California, a fictionalized documentary about skateboarders in East Germany. It’s actually a cover of a wildly popular Hungarian song called Gyöngyhajú lány or The Girl with Pearls in her Hair. AnnenMayKantereit is a relatively famous group from Cologne that somehow hasn’t achieved much popularity outside of Germany. Once you listen to lead singer Henning May’s voice, you’ll wonder why as well. This is the first song of theirs I heard, and the unique feeling of frustrated helplessness in the lyrics will never get old. This song was written and performed for the film Feuchtgebiete (Wetlands), in which the lead singer of Von Eden also has a key role. The band even made a quick guitar tutorial and put it on YouTube – of course, it’s all in German! … and all because of me! This is an old folk song that a professor of mine introduced me to in a literature course. It’s based on a nineteenth-century poem in honor of some Silesian weavers who rose up in protest of industrialization. Perhaps that sounds dry, but when put to music you’ll probably start feeling the revolutionary spirit yourself. You might already know the English version of this eighties hit, 99 Red Balloons. Personally I think the song is much better in German and you can really connect to the Cold War feeling through the lyrics. On the horizon there were just 99 balloons…. Do you want to make your German studies more efficient? Well, instead of passively listening to German music, I’ll teach you how you can read the lyrics and save and review new vocabulary in LingQ. 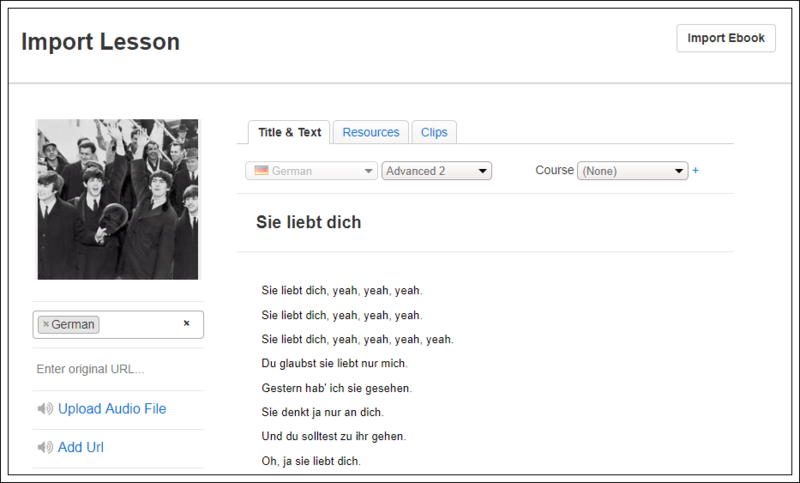 Just so we’re clear, you can import any German song (and its lyrics) and create interactive lessons that you can view on both your desktop and mobile (thanks to LingQ). First, click the import button at the top right of your screen once you’ve logged into LingQ (desktop). 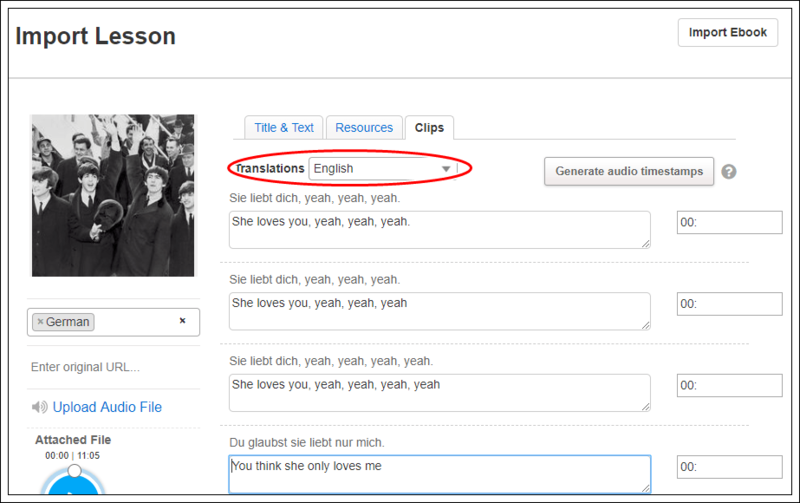 Paste the lyrics into the designated field. Be sure to add the audio too so you can listen to your favorite song and study the lyrics at the same time. Now, here’s a trick that will help make your translations even better. Most German lyric websites offer English translations. You can add these translations into LingQ so you don’t have to worry if the translations in your lesson are a bit off. To do this, go to the Clips tab and add your translation under each clip. Make sure the translations drop down menu has English selected (see the red circle). Now, when you save and open your lesson, each sentence will show a Translate Sentence button underneath. Click it and you will see the translations you’ve entered from the Clips tab. Please note, you must be viewing your lesson in sentence mode to get this feature. Instead of passively listening to music, you now have a full-blown lesson that helps you read and learn the lyrics faster, without having to bounce back and forth between online dictionaries. LingQ has everything (and more) to help you focus and build momentum as you study. Oh, it’s also on mobile too. Listen to your favorite German songs on your headphones and study at the same time! Keep studying hard, and may the music never leave your ears! Give LingQ a free try today. Author bio: Alex Thomas is a teacher, writer, and translator of several languages. He finds that the wide array of music out there in German is perfect for his eclectic taste in art.